Neopolitans are on the whole an argumentative bunch, something as simple as the correct recipe for Linguini e Vongole quickly spirals into argument and recriminations. Growing up, this was pure quick fix dinner for my mum, throw a jar of clams into tomato sauce, bung over linguini, whack child lovingly round the head with wooden spoon for being impatient and then serve. 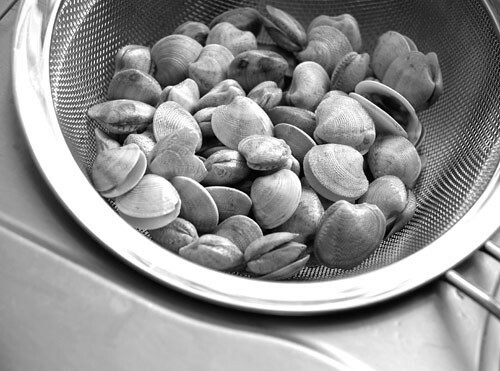 I loved those tiny clams and would pick them out first, the taste of the sea and slight grittiness a real pleasure for me. Now, the thought of tomato in this dish will horrify some Neopolitans who believe that vongole should only be served in bianco, actually to the point of forcing me to relinquish any claim I had to being Italian if I insisted on this heresy, in one case earlier in the week. If I have them fresh then I don't want anything in the way, I'll agree on that, but I much prefer a tomato sauce spiked with some chili with the tinned/in a jar variety of clams and before you go mocking my use of preserved clams, you'll want to try them in a dish like this first. They add a warm briny twang to the proceedings that the chili sits on top of looking very pleased with itself. Now, don't get me started on the whole fish / cheese deal. your piece on vongole inspired to make one recently. Thanks!